I wrote a piece about yesterday when I was lying in bed last night and thought it would save when I next wandered into a wifi area for posting. It did not. I lost it and I honestly cannot remember much about yesterday at the moment. It was long and at 37km was one of my longest days walking, if not ‘the’ longest days walking. It felt it. My legs and ankles woke this morning with a pounding feeling running through them and the thought of doing another 30km to Finnesterre didn’t seem any more appealing with the sound of the storm blowing outside. I got dressed and thought about staying in until light or at least until the rain subsided just a bit. Then eagerness took over and I thought, its the last day. If I get wet I get wet. I did maybe 1km in the dark and I saw a flashlight behind me. Another brave or foolish person starting early. Stefan from Slovakia caught me up and we got chatting straight away about football and music and it’s no lie to say before we knew it we’d covered 20km plus and could see the sea. Then after a few coastal towns and a thunderstorm with some of the heaviest rain I’ve walked in this whole trip Finnisterre came into view and the sun came out. We got our accomodation sorted and then got our certificates for the Camino Finisterre before having a couple of celebratory beers. Then in between rainstorms we made the final ascent to the lighthouse overlooking the port town. This is the end of the road. The roadsign gives you 0km to go and there really is nowhere else to walk if you wanted to. Stefan and I and a couple of other pilgrims just sat and took in the moment. It really was something special. We went to make the 2.5km walk back to town and a Colombian guy and a Swedish girl over in Spain for a music conference asked if we needed a lift back. We’ve finished the Camino so it’s not cheating anymore…..so we accepted. So that’s it. We will maybe go up to the top again in the morning for sunrise if the weather is clear, but thats just for pleasure. Its not part of the Camino. The Camino is over so this is the end. So back in April I started something I couldn’t finish…..at the time. Yesterday I finally got to Santiago properly. I had been there before but had a miserable time and barely left my hotel room, but I saw a different city yesterday and I did love it. After I wrote the blog I met a German couple from Frankfurt. They were trying to find the Albergue I was staying in so I brought them with me to the reception. They were on a roadtrip, Peter wanted to show his wife all the stops along the way from when he cycled from his front door in Frankfurt to Santiago. He couldnt wait to show me the photo of him lifting his cycle above his head in front of the cathedral. His wife just shrugged her shoulders as if to say “Oh he’s showing that bloody photo again to anyone that will listen” I think it had been a long day for her. They are driving to Finisterre today and they did offer to drive me if I wanted to rest my feet but where’s the fun in that!? I had another wander from the hostel into town in the evening and ended up having a couple of wines and a couple of beers and then needed something to eat. There are so many great looking cafes and bars but I found myself sat in a little pizzeria that was only wide enough to get one person in at a time. The owner turned forty last year and left Tenerife where he had worked for 20 years because he was fed up of the hot weather most of the time. He came to Santiago instead where it was very hot yesterday. He wasn’t pleased. I sat there chatting to him for an hour or so and then a British lad came in, heard me talking and asked me what I was doing in Santiago. I thought about saying “Try starting in France” but i didn’t want to burst his bubble and he did seem genuinely tired. And to be fair even from Sarria it is a long walk. It took a while to find the Camino Finisterre path but by half 8 I was out of the city and on the trail. It was a great days hike. Lovely woodland paths, nice picturesque towns and lovely hot sun. Managed to get through quite a bit of water today and had to use my neck scarf as a bandana to stop being burned. (My suncream was in the bottom of my bag and i couldnt face unpacking midway through the day. In the town of Augapesada i got chatting to a lady from Bristol called Meg. We stopped and had tortilla and a coffee whilst we rested. She has managed 6 weeks daily walking with no blisters whatsoever…..quite something. It is nice when you meet someone from home, i love talking to everyone you meet but it is good to find someone that doesnt think I’m Australian. I left her behind as there was a big 3km climb afterwards and my climbing power has improved greatly this trip, but hopefully I shall see her again. I arrived in Negreira earlier than expected. Since i didnt leave Santiago until later than I had hoped i thought it would be a later e.t.a, but my best foot forward new improved speed walking technique is powering me through. Nothing much to look at in town and i made my own dinner from a baguette and some cheese, plus stocked my travel food stash up for the long stage tomorrow. Very early start this morning. Partly because I was excited to get to Santiago ahead of the crowds and partly because someone had left a tv on in the hostel somewhere. So I left the place at 6.30am which meant 2 hours of night-walking, with a faulty torch. There were no street lights anywhere near and the forest walk that went from Pedrouzo to beyond the airport had such an overhang of huge trees it was slow going as I could only see a yard or so in front of my eyes. The path takes you past one or maybe the only runway at Santiago airport, right at the base/end of it. Then you pick up a few pilgrims who stayed at Lavacolla and before you know it…….actually not before you know it. It’s after a few horrible lonnnnnngggg stretches of road that you can see for ages. But, after that….you hit Santiago. Like every other city on this Camino, you think you’ve arrived but there’s a good half hour walking left. I was on my own though. Plenty of people going to work but no other struggling pilgrims with heavy, sweaty and beaten up backpacks. The path takes you right to the square that has the best view of the Cathedral. I stopped. Realised I’d done it…….then went to find the pilgrim office. Here, we had a few other pilgrims from all the different Camino routes that end in Santiago. I stood in line for half an hr or so until you get called to see a advisor. He asked me a few questions about my trip and issued me my cospostela. The certificate indicating you’re daft enough to walk 780km. Then I went and found my albergue, the main municipal one in the centre of town. It’s big but it’s pretty good. I have a very cheap room and the facilities are not bad at all. After washing the last days grime off me I wandered back into town to take in the sun. I on the other hand did consider staying in Santiago a few days until my flight home, but my journey was never about finishing in Santiago. So, just when you’re thinkin’things over, my journey continues tomorrow. 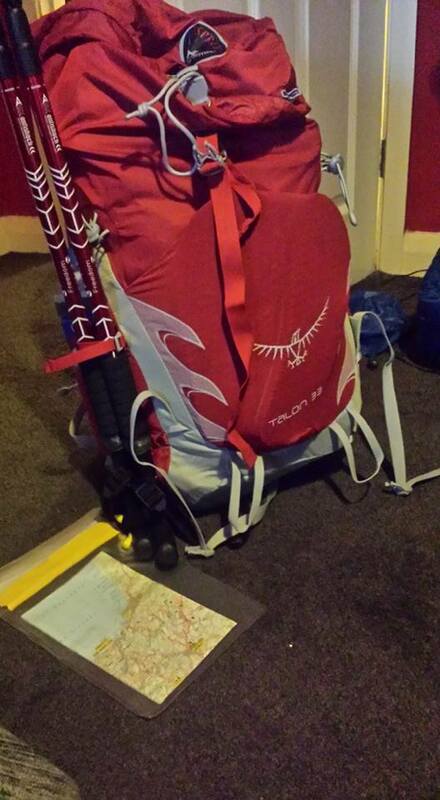 I start the short(ish) 3 day hike to the west coast of Spain, to Finisterre….or World’s End as it was known. A holiday in Spain this has not been. I don’t set my alarm over here but I always wake up at the same time. Half past 6 in the a.m. i give myself half an hr to come round properly and then get ready to leave. There was no one around this morning when I left the Casa and instead of walking down the highway for a couple of miles to find the Camino, I went back through the woods which took a good chunk of the days journey. The downside was it was blummin dark and thank god I brought my torch…..once again. Most people (as I have probably said before) dont leave until after 8, but where’s the adventure in that!? I am starting to feel some injuries coming, my left foot is aching alot but as long as i keep my body movin’ it doesn’t complain too much. I am looking forward to a day of not walking though! More pine and eucalyptus forests for much of today, all hugging the main road into Santiago. I went through the towns of Ribadiso and Arzua before the peligrinos staying there had surfaced and stopped for a coffee at Calzada. Had a chat to Kelly who I saw for the first time in a while and then had another drink at Salceda for the final push to O’Pedrouzo. I found my place pretty easily, freshened up and rested before grabbing some food at one of the towns cafès. I’m so tired Im definitely going to have an early night tonight so I can set off extra early tomorrow for Santiago to try and beat the crowds. Even if I dont it should be a shortish km day and I shall have time to take in the city properly…..as of course I have been here before! When you’re at home you can say pretty much that tomorrow will be like today. But i’m not able to say that tonight as i’m sure tomorrow night, I won’t be tucked up early to bed. I didn’t blog yesterday because really nothing much happened. I did walk about 25km i think it was but it was just in dirty rain and never really strayed too far from being near a road. Plus it was uphill. I stopped for a few coffees to warm myself up and had a brief couple of chats with an aussie. Even the cafè owners were miserable……it was just one of those days. I got to Palas de Rei at my usual time of half 1pm give or take and did the usual routine of 1) Shower 2) Rest and 3) Eat. Even though I’m pretty tired by now, when in a new town I can’t help but explore it. I know I should conserve energy but chances are I’ll never be back there again so I want to have a look round. Palas was really nice. Plenty of places to shop and to eat at but I pulled myself away and went back to the hostel to relax on youtube in an attempt to save money. Getting up early is not something many pilgrims are doing at this time of year but I think they’re missing the best part. It may be dark for the first hour on the road but it makes for a magical walk. As soon as I wake up nothing else matters but to get walking. Joining me on the road at the break of dawn today were two girls from florida. The path took us though dense woodland and without torchlight guiding us would have been next to impossible. We quickly got to the next town and picked up a few pilgrims starting later in the day. I stopped for a drink and then arrived at Melide where I had another one. Melide is another very nice place I would have liked to have stayed at but for it being situated too close to Palas de Rei. Lots of cafès, one of which I stayed at for a while to kill some time. From here the walk went through some great countryside. Lots of pine and eucalyptus forests and just as I was starting to think I had passed the place I wanted to stay at I saw a sign carved into a tree saying the hostel was through a shortcut in the forest. The owner personally cut down about 200m of eucalyptus trees to forge a path from the camino to his retreat. I’m not sure if he had permission, but even so quite a performance! Another full day tomorrow brings me pretty close to the airport where I flew into last week. From there it’s a final few km’s push to Santiago on Thursday……if today is Tuesday!? I’m not sure that’s right. Just looked and it all looks downhill tomorrow, the thing is the guidebook has a crafty way of making it look like an easy day before planting a testing climb right before the end. If I was sponsored by SKY I’m sure I’d be able to bring in some T.U.E’s towards the end of the day to make sure of a sucessful stage victory! The start I suppose. This morning, I got up early and went into the main sitting room which is open 24 hours at the amazing Paloma y Lena hostel. They lay out breakfast for you the night before so you can just wander in and take what you want. So I’m there making toast, having a coffee and justifying having a piece of cake in the morning when a woman joins me in the hall. Someone I hadn’t seen the night before. So i met someone who lived about 200m from where I do. This happens alot to me. We know many of the same people and she knows the man that sold me my first guitar! How he was mentioned I’ll never know. Then Sue from America came in and said, “I’m glad you two have met, I thought your accents were the same”. No kidding! In other news. I set off later today at about 8.15am and got to Sarria at 9ish I think. Then the crowds grew. It really is like you’re living in another world before Sarria. Lots of people join the Camino in the town because it’s near the limit of the minimum km’s you have to do in order to get your certificate. I tried not to get frustrated by the extra numbers or the people clogging up the pathways taking photos every few steps but it was difficult, and I probably failed. By 11 I had passed many of them and had also stopped for a tortilla bocadillo. From Sarria it goes uphill for 10km then a brief downhill stretch before another short climb and a big slide into Portomarìn. A few days ago the smell all day long was of wild fennell. Today it was cows due to the large number of farms in the rolling beautiful Galician countryside. The cows can take over the paths if you time it wrong. I am talking about the animals not people starting in Sarria. Today also marked an important Camino milestone. We passed the ‘100km to go’ mark. I shared it with a an Eastern European girl who couldn’t believe her camino was coming to the end or at least in the final couple of laps. I’m in Portomarìn writing this sat having a beer. I shall find somewhere else to see if anyone is about and then I shall go to bed to get up extra early tomorrow to beat the crowds. I prefer the quieter times especially when walking. I know I’m not going to see any of the April/May faces but I do keep looking expecting to see one of them passing by. It seems to be an older crowd at this time of year. Lots of Americans, Canadians and Australians on big bus tours ferrying their bags by courier to the next town. Not Sue though, she’s nearly 70 and hauls her big pack on her shoulders every day and walks faster than me. So I just pretend I want to stop and have a rest when I walk with her. It hurts less than trying to keep up. So after the bit above this I went to a bar and sat for a while and got chatting to a guy called Guy from Florida. We had a drink then dinner together and he has a personal story about Donald Trump and why anyone who would vote for him is an….well we don’t need to go there. He also has a story about a guy he met early on during his camino. The man was from the US and the two of them got on really well. They got on well enough that they decided to share rooms for the time they were walking together, to save money and because they liked each others company. They had a room and they were both sending emails and facebook posts back home to America in the evening but in the morning Guy woke to find his friend had passed away during the night. Guy is walking the remainder of the camino with both his and his friends camino shell on his backpack. He plans to dip them both in the Atlantic ocean before shipping his friends shell back to his waiting family in America. Wakin’ on a pretty day, this was not. I left my room at 7.15am and went into the bar area of the albergue where the owner had a log fire burning already. She works so hard, she does everything for her guests and doesnt seem to have a moment for herself. Anyway, Craig was up too and having a drink of coke to try and settle his stomach. He’s not at all well and was going to get a taxi to Sarria as walking was out of the question for him. I hope he feels better soon but I know what he’s going through and hope to see him in a couple of days. He told me the weather wasn’t that great but I had already heard the wind and rain swirling from the room. Leaving the hostel was bleak to say the least. If you’ve ever seen the film “American Werewolf in London”, it was just like that……only without werewolves. I hope!? My torch wasnt much use in the fog but it was fairly obvious which way to go, and I could see that as soon as I got beneath the clouds the sky looked blue. About an hour later I’d descended enough to be out of the rain and the sun was out as I arrived in Triacastella for my morning coffee. I saw 3 people here 2 of which take it in turns to push the 3rd in a wheelchair. I don’t know how they do it and hats off to them. I complain when my knee aches! I made great time on the downward parts and stopped at another cafe in the middle of a small village called Pintìn for the best Tortilla so far. So good that I considered another. Leaving here I passed a field with the biggest pumpkin I’ve seen….definitely top 5. It seems word gets around fast. I was travelling really easily today and it was nearly all level or downhill which I’m preferring at the moment. The uphills are making a slight leg injury I have ache a bit. So I soon arrived at the hostel that had been recommended to me just before the town of San Mamede Del Camino. Its a great place with hammocks, great menu (even though Im roughing it tonight on Super Noodles) and kittens. One of which has taken a shine to me and has been hanging out on the deckchair outside the room with me. Tomorrow I hope to get somewhere close to Portomarìn.